← How can Your Loved One Benefit from Hospice Care? The diagnosis of a terminal illness can be emotionally heartbreaking for the patient and the primary caregiver, which task typically falls on the family members. Getting Hospice care in Avon Indiana can be a relieving option for both the patient and the family caregiver as their loved one can be aided in their painful symptoms. Do you have a loved one who needs end-of-life care so they can have a quality of life in their remaining time? If you do, then you need all the support you can get. Here are important reminders when it comes getting the kind of support you need in this kind of hospice care situation. You need to be in constant or regular communication with your other family members and friends. This connection can enable you to find inspiration, encouragement, and hope when the challenge of caring for a loved one becomes difficult. Spend some time to go out with them on a regular basis so that you can still be plugged in to the things that can give you joy and life. When your loved one is in a terminal condition, it’s also important to find support from people who go through a similar situation—be they parents with loved ones in terminal condition, or the patients themselves. What’s important is that there are others who can affirm the struggles and difficulties that you may be feeling and facing. There are many different support groups that you can connect with. 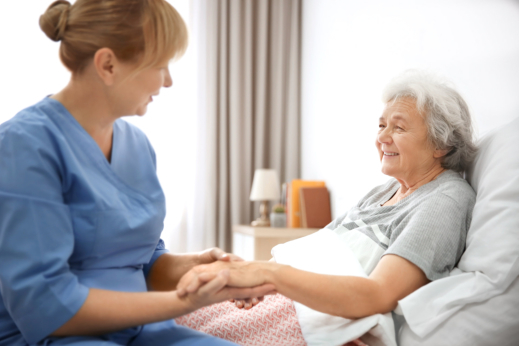 Our social workers providing Hospice services in Indiana can help you get affiliated with them. When your family member is living with a terminal illness, they are also especially monitored by their healthcare team. This includes their doctors, specialists, nurses, pharmacists, and even you. You have to establish proper coordination with these healthcare professionals as they can provide you with important information on how your loved one is doing. They can also provide vital details on how you can properly attend to their care needs. Don’t hesitate to also seek for assistance from skilled professionals who know how to help you manage the care needs of your loved one. There are agencies which provide Inpatient hospice so that you have extra hands to work with when it comes to assisting your loved one. These skilled professionals are also dependable when you need to get a personal break, which is also very important for you to do so that you can be in your best self to care for them. Getting the right kind of support when you are providing end-of-life care can be truly comforting especially when your immediate family members are living from miles away. Here in Indiana, you can trust our team at Life’s Journey of Avon to help you out when you have a loved one who is receiving hospice care. To help you answer your inquires, contact us. This entry was posted in Hospice Care and tagged Family Caregiver, Healthcare, Senior Care. Bookmark the permalink.